Shades of Death: Royal Blood. The title of this game speaks for itself. 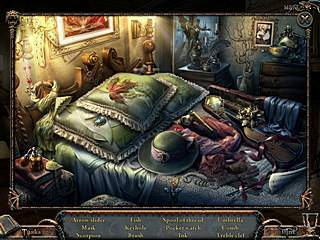 Right from the start you understand that everything in the storyline of the game will comprise death, blood, murder and mysteries. 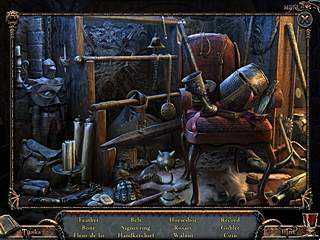 If you like dismal games with lots of locations and hidden objects, if you are fond of ghosts, ancient castles and knights, there are no lingering doubts that you will get everything that you would expect from this game. There is a list of tasks and if you are stuck you always can have a look at it. You take the road and when you arrive to the Castle the first thing that puts you on your guard is that Violet, who is supposed to meet you, doesn't appear. What is more, the gate is closed and in order to get in you have to fulfill some tasks. From the very beginning you have deal with hidden items and mini-games. A prefect hint system helps you in each location and if you find mini-games rather complicate you always have a chance to skip it without any penalty. 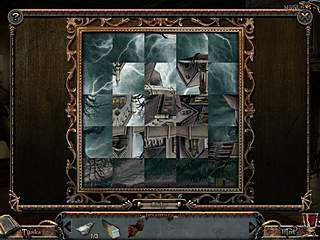 Actually this nice balance of both hidden object scenes and puzzles is a winning combination. The mini-games go as a natural part of the quest. It would be boring only seeking items all the game through. Although the HOG-scenes are the basics of Shades of Death: Royal Blood. But be aware you will have to ramble back and forth, from location to location really a lot. Hints could make your search easier and gives you ideas of where you need to go. 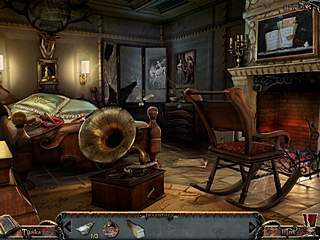 As for hidden object levels themselves, they are not very crowed and easy to complete. You have the whole list of items to find, which are in a normal size. And just clicking on anything you will most probably choose the correct one. There is one disappointed moment - if you decide to play for the second time you will be faced with the same objects in the list. But if you’re keen on achievements, that is your chance to play without mistakes. On the other hand, if you are looking for difficulties you may begin the game again by choosing the advanced mode, which slows down the skip and hint recharge and remove twinkling stars that indicate active zones. The game isn't voiced, so you have to read all the dialogues, lucky there are not many of them. So it couldn't be called the drawback of the game. The lack of voice is compensated with quiet background music which is accompanied you during the game. Everything: dark colors, ghosts, tense music, mysterious puzzles, pieces of newspaper, blood are here to help you to get involved into frightening exploring round the Family Castle. Graphics are generally adorable and very well done as well as the entire game. Overall Shades of Death: Royal Blood well deserves your attention. Help, I've been ifonremd and I can't become ignorant. wow thats cool!but its way to high! its hard to earn money ya know and since uve made non member ctmsuoes maybe u can umm.. make new ets and houses and furneture to its still not as fair that they can get houses and non members cant get anything but a few lil ctmsuoes that r 1000 and 800 900 700 cions and houses r high i wish i could get a house but i cant cuz im not a member ='(plz do something to make it all ALL All fair for everyone pesto and i speak for everyone wen i say this! This is Shades of Death: Royal Blood review. Download this game here.